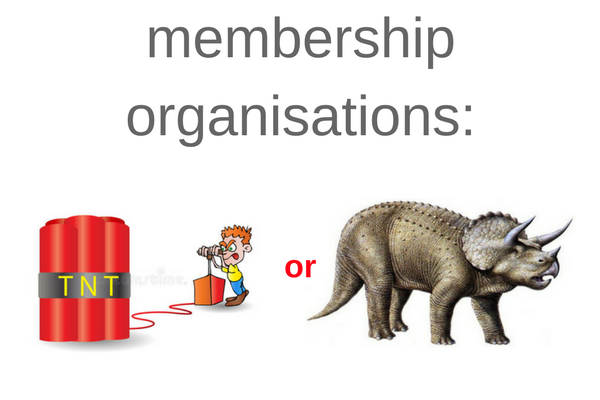 adrianmalpass.com » Business membership organisations: commercial dynamite, or business dinosaur? Business membership organisations: commercial dynamite, or business dinosaur? Posted on 13th October 2017 by AdrianM in #GlosBiz, Business, Development, Growth, Local business, Management | Comments Off on Business membership organisations: commercial dynamite, or business dinosaur? As many of you will know, I created and run the GlosBiz® initiative on a voluntary and not-for-profit basis. In just 7 years, the initiative has become Gloucestershire’s largest business network, and one of the many questions I am regularly asked about it is why do I have a commitment to never charge membership fees. The main reason is simple – I aim for the GlosBiz® initiative to be equally accessible to every Gloucestershire business, from the newest to the oldest, and the smallest to the largest, and for them all to feel equally valued, no matter who they are. But membership-based organisations, almost by definition, simply cannot do this. They are obliged to give their members at least some sort of priority, and other benefits, or what would be the point of stumping up the, often very high, membership fees? So, a couple of months ago, when I was first thinking of writing this article, I started to look for some research data on business memberships, and ended up gathering some data from Gloucestershire businesses who belonged to a range of business membership fee-based organisations and networks locally. Do you consider your membership fees to represent good value and provide benefits for your business? How much do you pay for your annual membership fees? Do you carefully review whether or not to renew your membership at the end of each membership year? Do you consider your membership good value (N.B. : as a percentage of those who responded in Q2 above)? Do you consider your membership poor value (N.B. : as a percentage of those who responded in Q2 above)? Instead of paying annual membership fees, would you move to a membership free or low-cost monthly subscription organisation if you received the same benefits? So, what conclusions can we extract from this (simple) data set?